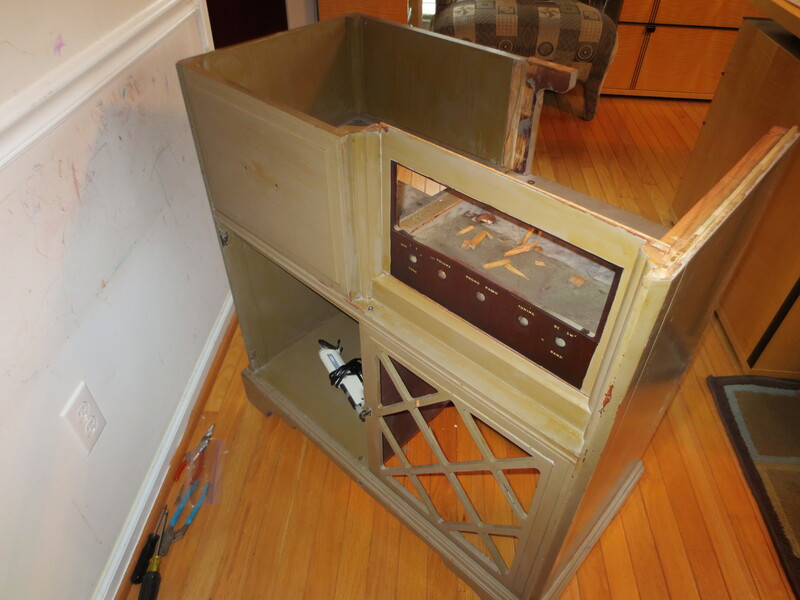 Lately I have been seeing people take old radios and turn them into something hideous that they call functional art. People will paint them, or turn them into a minibar or even tile them with ceramic tile. If you take an old cabinet that is on its last legs with a non working radio then I can forgive you for this. 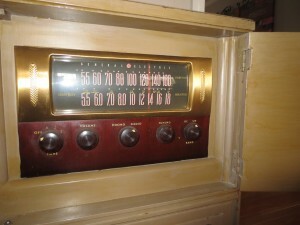 But if the radio is perfectly functioning and the case is in good shape, then you are destroying a piece of history. My wife picked up this set at an auction for $5. The radio worked perfectly. 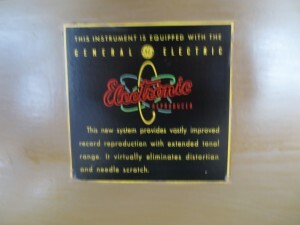 The record player was pretty shot, however. Also, someone painted it Olive Green (who knows why?). 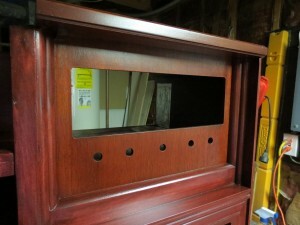 We decided to refinish the piece and make it a charging station for all of our ipads, laptops, iphones, etc. My wife likes to keep things neat and orderly (just a little bit OCD) so this would keep them charging and out of sight. So, here it is. At this point, i have already removed the top, the phonograph and the radio. 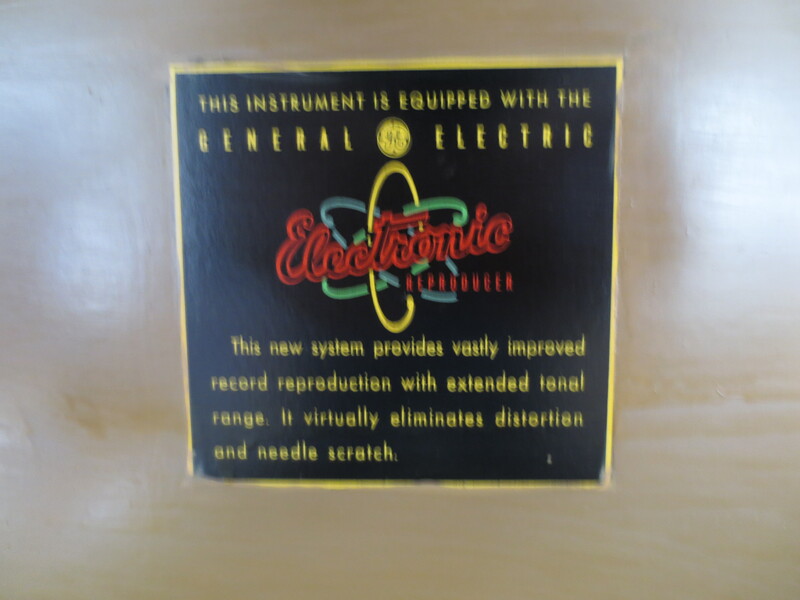 There is a cool looking logo on the inside of the phonograph lid so I want to try and preserve it. OK, time to work. Stripping the paint was easy (a relative term because it was still a lot of work). 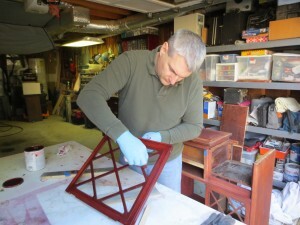 Since the paint was over lacquer finish, using lacquer thinner did the trick and was easy on the wood. After completely stripping all the lacquer and building in some shelving, it was ready to add the stain. After the stain, I used spray clear lacquer (instead of Poly to keep the original type finish) to bring out the luster of the original color. 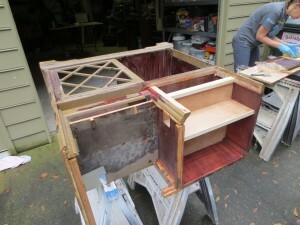 Stain was matched to an original unpainted and un-aged part form inside the radio. 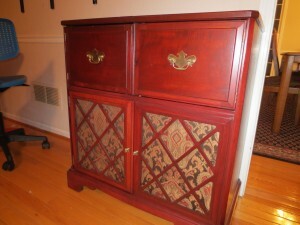 New fabric with the right “feel” was used to replace the badly aged speaker fabric. 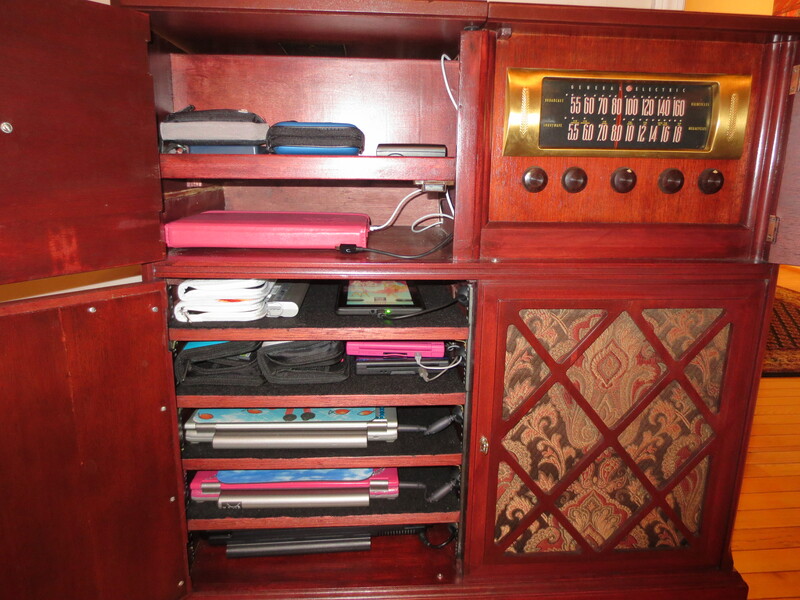 Now we have a charging storage station for all the electronic goodies that the family have and it closes up to a nice piece of furniture. And the radio still works as well picking up 750 WSB as clear as anything you will ever hear (the old radios were not band-limited like today’s pieces of junk). also sounds good with a bluetooth receiver on the aux input!